Your South Florida Trusted Pros for Mexican Tile Services. After receiving the tile at our warehouse, our first step is to grade the tile. This involves examining each tile. Small surface chips are lightly sanded smooth. Tiles with large, deep chips and tiles that are badly warped are held out as cuts. Using these tiles would create an uneven floor, so we choose to be very selective. Once the tile has been graded, we pre-seal the tile. Since the raw tiles are very porous, we spray the sealer on with special sprayers. This gives the tiles an even coat without swirl marks or sponge/roller lines. The number of coats and type of sealer used in this pre-seal process depend on the specific needs of your job. The pre-seal process also has a lot to do with the final tone of the floor. When the pre-seal process is completed, we box the tiles and they are ready to take to your job. Our installation procedure is unique in that we take into account the fact that each tile is handmade and thus not exactly alike. Some tiles may not be exactly flat, some larger, some smaller, some thicker, some thinner. Our back buttering process allows us to adjust that particular tile to the tiles adjacent to it. This results in a smooth, flat installation. Our grouting procedures result in a full grout joint which further makes the floor flat and smooth. The end result of our installation and grouting procedures is a floor that is comfortable to walk on in bare feet. After grouting is complete and the floor is dry, we apply the finish coats of sealer. The type of sealer used depends on the hue you are looking for. Dark or light, matte finish or glossy. Generally, 3-6 additional coats of sealer are applied for the finished floor. The final seal will protect the floor and enhance its natural colors. 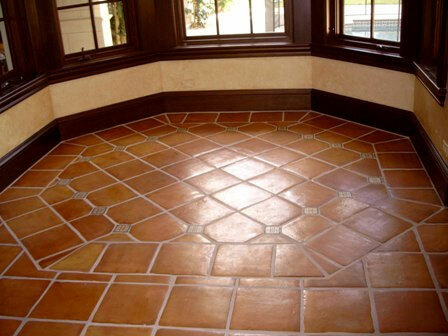 With our installation procedures, we feel we enhance the beauty, character, and authenticity of handmade Mexican Saltillo tile for years of enjoyment in your home. 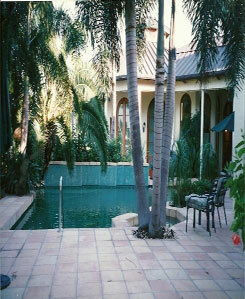 Work in South Florida in all the major cities including Boca Raton, Delray Beach, Fort Lauderdale Boynton Beach.